Die Nacht is the first out of nine strophes in free verse that together make up the cycle Brot und Wein (Bread and Wine). In the poem Hölderlin evokes the image of a city at nightfall, how daily life winds down and the moon and stars rise – comparable to the atmosphere of the opening of Nietzsche’s Im grossen Schweigen (In the Great Silence, RC 67). In Hölderlin’s idea of the world, which is influenced by Greek mythological and pre-Socratic literature, these elements are chiefly symbols of man’s position in the universe that surrounds him. However, it was in the first place the beautiful language and atmosphere of this verse that appealed to Diepenbrock. The fact that he wanted to restrict himself to this, explains the various liberties Diepenbrock took with the text and the contents of Hölderlin’s 18-line poem. The orchestral introduction starts with a soft timpani roll. Above this, from a low register, a viola develops an ascending melody via the intervals of the minor major seventh chord d-f-a-c#. In m. 4 the double basses join the organ point c# in the timpani and ascending chord progressions (again in a low register) are combined with a lonely, soaring melody in the flute, in which there are three note repetitions. Ten measures later a melody – this time in brilliant major – appears in the high strings that is characterised by a descending opening motive. Throughout the composition this melody sounds every time the text refers to the approaching night. Then follows an episode that, through its rhythm and its melodic structure, temporarily evokes a feeling of unrest – an atmosphere which is largely created by a persistently strumming mandolin (a continuous semiquaver motion that carries on for seven measures). Only when the melancholic flute melody and the ascending chord progression are repeated, does everything settle down. The opening words “Rings nun ruhet die Stadt” are sung to the motive c#–c#–e–d–d–c#, which shortly before the ‘unrest’ episode had been played as a counterpoint to the flute solo; thus, these words in fact mark the end of the introduction. Accompanied by a subtle web of voices that alternately refer to the different motives from the orchestral introduction, there follows a vocal description of the subsiding street noise and the driving off by torchlight of the carts, which are empty now that their load of fruit and flowers has been sold. Tired with working, the people go back home; a thoughtful man works out his profit and loss. An orchestral intermezzo, mainly based on the ‘unrest’ motive, calls to mind the busy market: a descending tritone repeated three times in the bassoon and tuba depicts the lowing of oxen. When six measures later everything is peaceful again, the solo violin starts a lyrical development of the descending major melody, accompanied by broken chords in the harp, introducing the accompaniment to the line “Aber ein Saitenspiel tönt fern aus Gärten.” (But string music sounds from distant gardens.) In his music Diepenbrock also subtly frames the question whether it is a lover who plays, or a lonely man reflecting on far-off friends and his youth. Splashing fountains, symbolised by rushing, alternating, descending and ascending chromatic lines, are replaced by the ringing of bells. To depict this, Diepenbrock uses the same three-note motive with which he portrayed the church bells of Cologne in Vondels vaart naar Agrippine (Vondel’s Voyage to Agrippine, RC 64) and Genoa in Im grossen Schweigen (In Great Silence, RC 67), but this time he combines it with different ostinato-like patterns that also include semitones. This section concludes with the broadly sung phrase that a watchman, heeding the time, calls the hour. Sadly and beautifully over the mountain tops. After the words “die Nacht kommt” Diepenbrock interrupts the vocal part with a three-measure instrumental reference to the ‘night’ melody, before giving the next line. However, because of the continuous setting of “Voll mit Sternen und wohl wenig bekümmert um uns / Glänzt die Erstaunende dort”, there is now a discrepancy between Hölderlin’s text and Diepenbrock’s music. What Diepenbrock could not know, was that in the definite version of the poem Hölderlin was to write a semicolon after “Kommet geheim nun auch”. After that the poet temporarily changes the subject (“Nacht” again), and only after the words “voll mit Sternen” (as the comma there in the official Hölderlin edition shows)1 does he return to the image of the moon, but now in the manifestation of Selene, the Greek goddess of the moon, who visits earth every evening as a stranger to kiss her dead lover Endymion. The fact that Diepenbrock chose to set the words “Die Fremdlingin unter den Menschen” to the lonely flute melody from the beginning of the orchestral introduction, suggests that he must have been aware of Hölderlin’s import of the text. 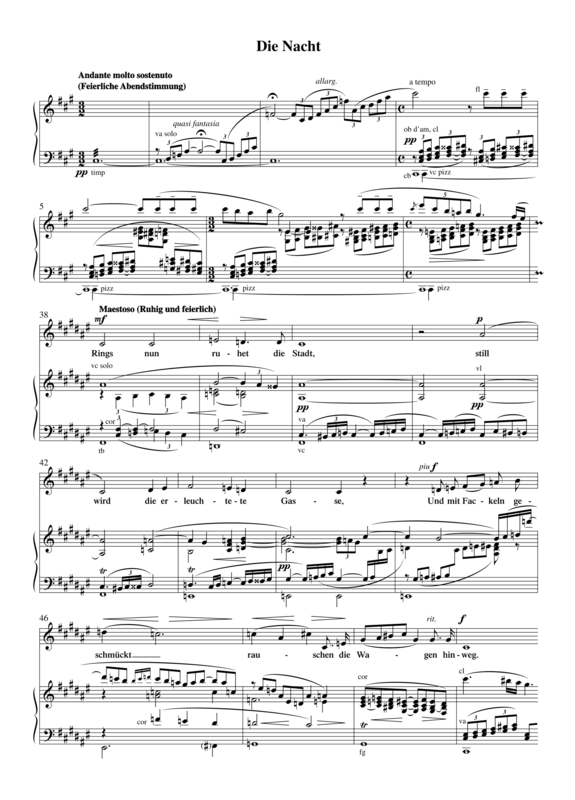 On the long sustained final note c# in the voice (on the last syllable of “traurig und prächtig herauf”) the solo trumpet starts a melody depicting the course of the rising moon, which ascends over four measures and ends in an overwhelming A dom7 chord (i.e. a chromatic-third relationship with the tonic). Then the solo violin plays the shining ‘night’ melody once more. After a repetition of the trumpet melody, the composition concludes with ingenious counterpoint in which the melancholic flute melody and the ‘night’ melody come together. 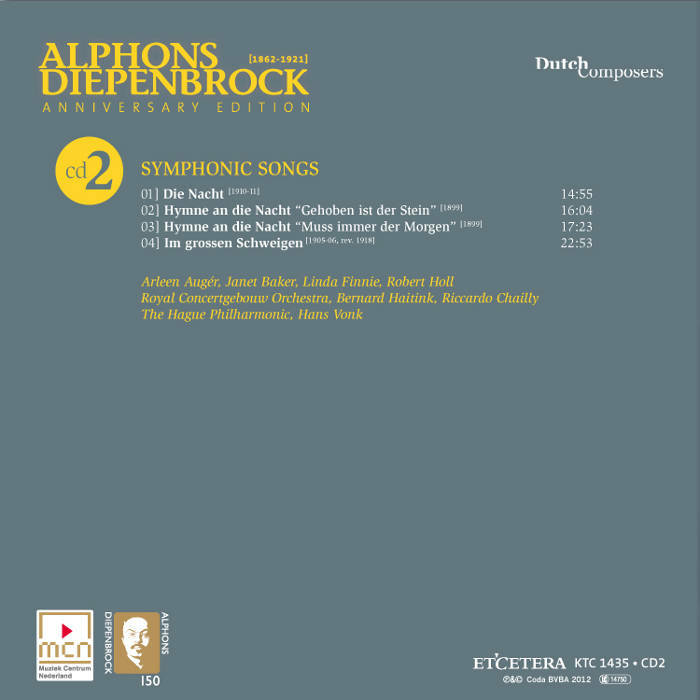 Being the last in the series of orchestral songs that Diepenbrock composed between 1899 and 1911, Die Nacht is a definite musical and compositional highlight. The work stands out because of its suggestive musical language, the apt and colourful melodies the words are set to and the cleverly developed and transparently orchestrated accompaniment of the voice. The progress of the work can be followed closely in the correspondence between the lovers. On 16 December 1910 he told Jo that the orchestration of the introduction, the revision of the vocal part and the changes to the mandolin part had been completed. Around the turn of the year, when it was dark early, it was difficult to keep the inspiration coming: “All this makes me get stuck with a work, especially one that takes so much effort as this Nacht.” (BD VII:119) On 7 January 1911 Diepenbrock sent Jo the last section of the piano score for copying. He reached the end of the score on 23 January. did not forget them and the sea shone under its twinkling light. Ilona Durigo (1881-1943), who had been Diepenbrock’s friend ever since performing his hymn for alto Muss immer der Morgen wiederkommen (Must the Morning Always Return, RC 50) in October 1909, gladly accepted that the work was to be dedicated to her. The premiere by the Hungarian alto and the Concertgebouw Orchestra, conducted by Willem Mengelberg, took place in the Centre for Arts and Sciences in The Hague on Saturday evening 14 October 1911. That morning Diepenbrock presented the piece to the orchestra, after which Mengelberg continued the rehearsals. In the evening there was a nervous atmosphere, as the concertmaster Louis Zimmermann, who had run through the solo part at the composer’s home earlier, and the first viola player Herman Meerloo, who had an important part in the opening of the piece, both fell ill. This had a negative effect on the performance. Mengelberg did not perform Die Nacht again in the Netherlands during Diepenbrock’s lifetime. He programmed the work once with the Frankfurt Museum Society, of which he had been the conductor since 1907. Diepenbrock would have liked to attend that performance on 27 February 1914 with the soloist Durigo, but he changed his mind at the last moment because it coincided with Debussy’s visit to Amsterdam for a guest performance with the Concertgebouw Orchestra on 1 March. At this concert he conducted two of his Nocturnes, the Prélude à l’après-midi d’un faune (Prelude to the Afternoon of a Faun) and the Marche écossaise (Scottish March) and he also played several piano works. After the First World War had broken out, Diepenbrock’s works no longer stood a chance in Germany because of his criticism of the German aggression, which he voiced in polemic articles. In the spring of 1914 Diepenbrock made preparations for the printed editions of Die Nacht and the hymn for alto Muss immer der Morgen wiederkommen (RC 50). The publication of his most important compositions was now within reach, thanks to the money he had received from his friends for his fiftieth birthday in September 1912. The proofs of the piano scores of the two works were ready in August 1914 when all Europe was being mobilised. It was not until 20 August 1915 that Die Nacht could be published. Huge inflation prevented the score from being engraved as well. The first performance in the Netherlands after 1911 was under Diepenbrock himself on 14 November 1918. He conducted the Concertgebouw Orchestra in a programme with, before the interval, works by Boieldieu, Fauré and Debussy and, after the interval, Die Nacht, the overture De Vogels (The Birds; see RC 139) and the hymn for soprano Gehoben ist der Stein (Uplifted is the Stone, RC 49), sung by Aaltje Noordewier-Reddingius. The alto Johanna Zegers de Beyl (1885-1977) was the soloist in Die Nacht, in the metric translation by Balthazar Verhagen, which Diepenbrock had included in the front of the printed piano score. After Diepenbrock’s death, Ilona Durigo continued to perform the work regularly; she sang it on 27 March 1924 with the Concertgebouw Orchestra, conducted by Karl Muck. For the programme celebrating her hundredth concert in Amsterdam, on 12 November 1931, as a matter of course. Durigo selected Mahler’s Das Lied von der Erde (Song of the Earth), which she sang together with Jacques Urlus, as well as Diepenbrock’s Die Nacht. 1 This interpretation is supported by the punctuation in the earliest transmitted version of Hölderlin’s first strophe titled Die Nacht on p. 90 of the Musen Almanach, 1807. Und mit Fackeln geschmückt rauschen die Wagen hinweg. Über Gebirgeshöhn traurig und prächtig herauf! 14 okt 1911: 's Ochtends repetitie van Die Nacht in het Concertgebouw te Amsterdam met Ilona Durigo als soliste. Achtereenvolgens dirigeren Diepenbrock, Willem Mengelberg en Evert Cornelis het werk. 's Avonds eerste uitvoering in het Gebouw voor Kunsten en Wetenschappen te 's-Gravenhage door Ilona Durigo met het Concertgebouw-Orkest onder leiding van Willem Mengelberg. Het programma vermeldt verder de ouverture Anacreon van Cherubini, Le Déluge van Saint-Saëns, liederen van Grieg en Liszt en na de pauze de Derde symfonie van Beethoven. Diepenbrock's Die Nacht toont alle kenmerkende eigenschappen van diens muze. Het orkest klinkt rijk en doet in afwisseling van tinten niet onder voor dat van de beide grooten wier invloed onmiskenbaar is, Strauss en Wagner. Dat Diepenbrock zijn inspiratie nauw aan ieder woord van den tekst doet aansluiten geeft aan zijn taal iets onrustigs en al te uitvoerigs. De groote lijn wordt dikwijls verdrongen door de detailbehandeling. Waartegenover weer staat, dat er onder die afzonderlijke momenten vaak vondsten van groote schoonheid voorkomen, die men zou willen vasthouden en nog eens hooren. Daar waar de tekst zwijgt, in de tusschenspelen, en vooral in het naspel, staat Diepenbrock's muziek het hoogst, hij heeft hier veel meer logisch aaneengebonden en zich breed ontwikkelende stemmingen. — De componist, die voor het voetlicht komen moest om de hartelijke hulde van het publiek in te oogsten, zal zeker meer dan tevreden geweest zijn over de interpretatie. Wel ligt het werk voor mevr. Durigo wat laag en was er een zekere voorzichtigheid van intonatie te merken, verklaarbaar overigens door de zeer moeilijk te begrijpen harmonie-wendingen – maar zoowel in expressie als in klankschoonheid gaf de zangeres veel te genieten.